Measuremail, a dutch email service provider that fully focuses on email marketing has just released an new version of their A/B testing functionality. The new split run testing makes it easier and less time-intensive to do A/B split testing and allows for campaigns to be deployed based on the winning version of the email creative. The A/B split functionality is wizzard based, meaning that the configuration can be done from inside the software and is flexible / adjustable per campaign or A/B test. Sender name, subjectline and message testing are standardized options as well as a totally free option that lets you define all the parameters of the test versions. Starting with the latest release, the split run testing feature will be available to all current and future clients through the front-end of the ESP. 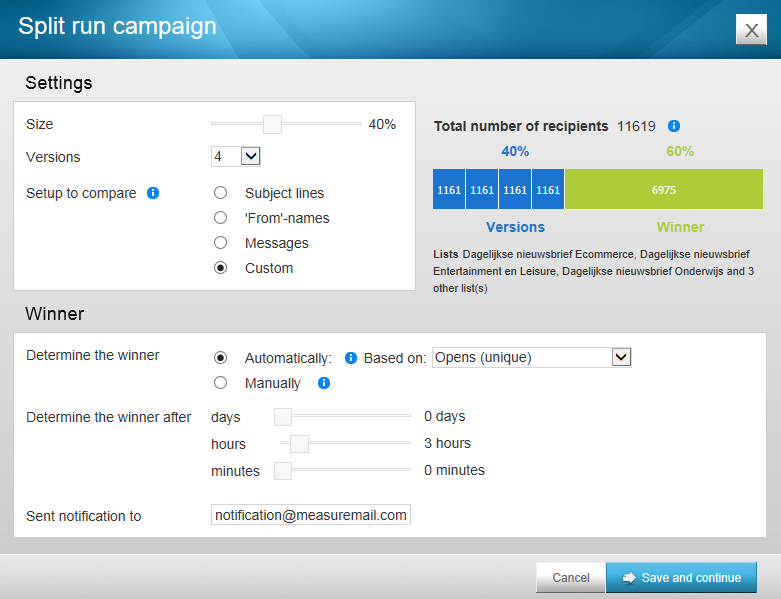 Measuremail believes in the possibilities of e-mail marketing. A dutch email service provider founded in 2000.